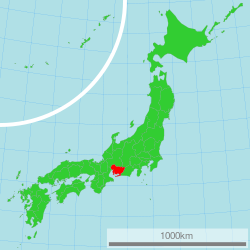 Aichi Prefectur (愛知県, Aichi-ken) is a prefectur o Japan locatit in the Chūbu region. 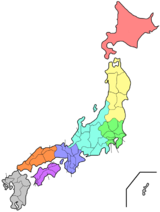 The region o Aichi is kent as the Tōkai region. The caipital is Nagoya. It is the focus o the Chūkyō Metropolitan Aurie. ↑ Nussbaum, Louis-Frédéric. (2005). "Aichi-ken" Japan Encyclopedia, p. 11 at Google Books; "Chūbu" Japan Encyclopedia, p. 126 at Google Books. ↑ Nussbaum, "Nagoya" p. 685 at Google Books. Wikimedia Commons haes media relatit tae Aichi Prefectur.